This entry was posted in Birds, Journal, Nest and tagged ink, natural history illustration, nature, nests, sketchbook by Jean Mackay / Drawn In. Bookmark the permalink. Beautiful sketch and poem, and even more beautiful together, very soothing and sweet. Thank you. You are very welcome. I’m glad they fit so well together. wonderful! poem and art. Happy draw a bird day! Thanks– I did this without thinking that it was Inktober or Draw a Bird day. I just needed to get back to basics. Thanks Lin– Hope all is well with you! Absolutely beautiful, for eye, mind, and soul. Thanks Cathy. It’s nice when things turn out that way. I love your drawing and the poem is a perfect for it – beautiful work…. Thanks Evelyn! I was happy with the way they fit together. Yes indeed. This nest was pretty messy, too, so I wasn’t sure how it was going to turn out…the poem was perfect for it. Simple, beautiful, delicate …nature. You have captured it Jean. so beautifully captured. Such intricate work. A nest has been on my list for ages. I really should get in and try one for inktober. Truly beautiful and inspirational. If you have a nest, why not give it a go! My advice is to keep it loose at first and keep your hand moving, following the general shape of the nest. Once you have the basic structure, you can start to pick out strands and get more detailed. The bird has done most of the work for you– the thing of beauty is already created. Such amazing creations from amazing creatures. Such a pleasing page! Great work,I love your drawing. You have reminded me that I have a nest in a box somewhere,might get it out and look at it! I have another two in boxes that were recently given to me… sounds like there are nests in store for both of us. Lovely sketch of found nest. A beautiful sketch/drawing!! i’ve quietly come to your blog for a long time, enjoying each entry…but especially nests. They speak to something in my soul! This poem and drawing so belong together. I love both! Thanks for sharing. Thanks Bonnie- I appreciate you reaching out and following my blog. As you know, I love finding and sketching nests. My sister-in-law recently brought me two, so more are to come. This is illustration is so beautifully detailed (•ө•)♡ ! Thank you…that’s what I love about nests– such beautiful form and detail. Lovely poem and a beautiful sketch. Thanks…your blog is pretty fascinating. Keep giving voice to women! Thanks Sachin–glad you had a chance to visit! 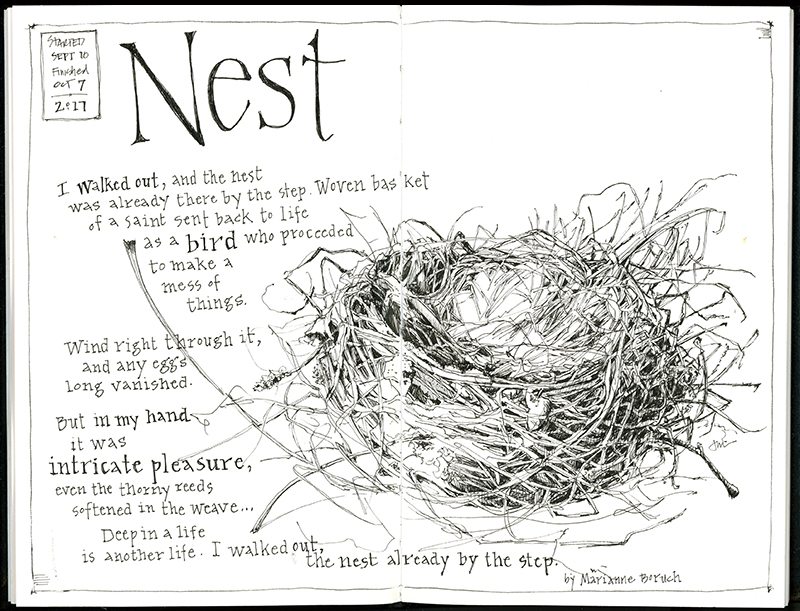 I love the looseness of the sketch and the way the words wind around the drawing of the nest itself. Lovely! Thanks Lainey. I always like to start a nest loosely and then tighten up as I go, based on how tight the nest is woven. This one had come undone quite a bit, so I kept it pretty loose. Thanks for following! Beautifully designed, written and drawn!